Electronics Costs > How Much Do Fiber Optic Cables Cost? How Much Do Fiber Optic Cables Cost? As the name implies, fiber optic cables contain one or more optical fibers which are coated with a plastic layer covered in a protective tube. Fiber optic cables feature fast data transfer speeds with less information lost, which makes these cables highly dependable and widely used today. On average, fiber optic cables can cost anywhere from $1 to $5 per foot if you were to have it professionally installed. The cost to have it professionally installed will depend on the location of the nearest active fiber line, the fiber count, the number of drops inside the building and what kind of conduit your building. For instance, if the building already has conduit installed, then costs can be much cheaper. If purchasing just the cable, it can cost about $0.20 to $1 per foot when purchased in bulk, which is usually more than 500 feet. For instance, Markertek.com lists about 25 different fiber optic cables in bulk, with prices ranging from as high as $1.09 per foot to as little as $0.22 per foot. Alantech.net breaks down eight factors that can affect the pricing of fiber optic installation. This includes the nearest active fiber line, the existing conduit, the physical obstacles, the amount of space available in a telecommunications room, the power sufficiency and how vast the footprint is. The U.S. Department of Transporation, for example, listed actual costs cities had paid across the United States. For example, in North Carolina, they had paid $21,700 per mile along I-85, while in Montgomery, Alabama, they had paid $12,875 per mile to install. Fiber optic cables will be made of strands of glass or plastic fibers are thin as a piece of paper. Surrounding this glass core will be a cladding material and buffer coating. Unlike the traditional coaxial cables found inside a home, fiber optic cables can carry signals over a hundred times faster and can handle high loads of bandwidth. These cables are also known to be more reliable, thinner and non-flammable. There are two common types of fiber optic cables: a single-mode and multimode. A multi-mode cable will have a larger core and is able to transmit more signals than a single mode that’s able to transmit only one signal per fiber. When installing, multimode cables will be used for shorter distances. 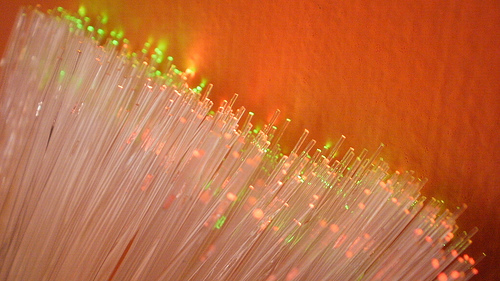 Fiber optic cables will be rated at 10, 40 and 100 Gbps. These cables are often installed inside a local area network or connecting workstations to an inside network. By in bulk, as noted above, can often cost a lot less than purchasing a six-foot cable. When buying 100 feet or more at a time, the costs can significantly go down.